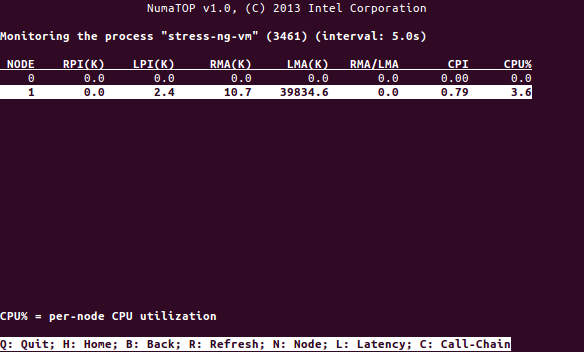 NumaTop is a useful tool developed by Intel for monitoring runtime memory locality and analysis of processes on Non-Uniform Memory Access (NUMA) systems. 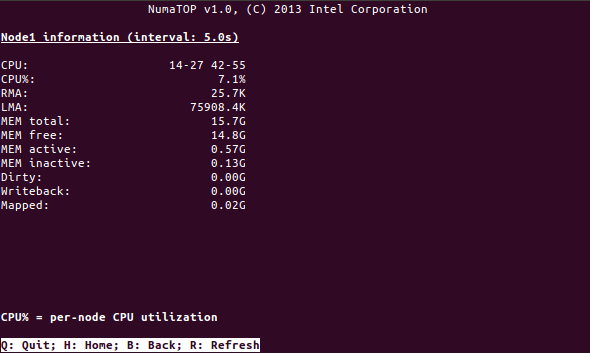 NumaTop can identify potential NUMA related performance bottlenecks and hence help one to re-balance memory/CPU allocations to maximise the potential of a NUMA system. One can select specific processes and drill down and characteristics such as memory latencies or call chains to see where code is hot. The tool uses perf to collect deeper system statistics and hence needs to be run with root privileges will only run on NUMA systems. I've recently packaged NumaTop and it is now available in Ubuntu Wily 15.10 and the source is available on github. A while ago I was working on identifying busy processes on small Ubuntu devices and required a tool that could look at per process stats (from /proc/$pid/stat) in a fast and efficient way with minimal overhead. There are plenty of tools such as "top" and "atop" that can show per-process CPU utilisation stats, but most of these aren't useful on really slow low-power devices as they consume several tens of megacycles collecting and displaying the results. I developed cpustat to be compact and efficient, as well as provide enough stats to allow me to easily identify CPU sucking processes. To optimise the code, I used tools such as perf to identify code hotspots as well as valgrind's cachegrind to identify poorly designed cache inefficient data structures. The majority of the savings were in the parsing of data from /proc - originally I used simple fscanf() style parsing; over several optimisation rounds I ended up with hand-crafted numeric and string scanning parsing that saved several hundred thousand cycles per iteration. I also made some optimisations by tweaking the hash table sizes to match the input data more appropriately. Also, by careful re-use of heap allocations, I was able to reduce malloc()/free() calls and save some heap management overhead. Some very frequent string look-ups were replaced with hash lookups and frequently accessed data was duplicated rather than referenced indirectly to keep data local to reduce cache stalls and hence speed up data comparison lookup time. The source has been statically checked by CoverityScan, cppcheck and also clang's scan-build to check for bugs introduced in the optimisation steps. 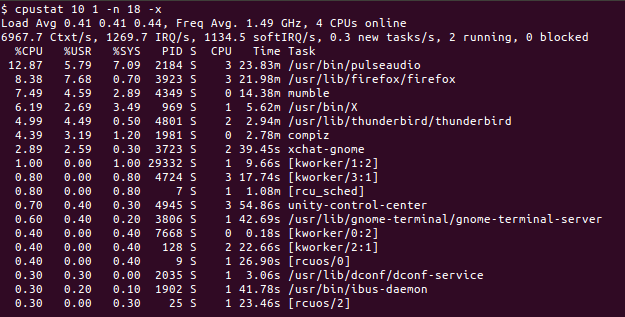 cpustat is now available in Ubuntu 15.10 Wily Werewolf. Visit the cpustat project page for more details. The Intel Thermal deamon (aka thermald) actively monitors thermal sensors and will modify cooling controls to try to keep the hardware cool. By default, thermald will run in a "zero-configuration" mode and attempt to use the available CPU Digital Thermal Sensor(s) (DTS) to sense the temperature and use the P-state driver, Running Average Power Limit (RAPL), PowerClamp and cpufreq to control cooling. Some systems may not work well in the default mode, perhaps the machine just runs too hot and one would like to tweak the settings to kick in passive or active cooling at a lower temperature than the default configuration. Thermald has a configuration file /etc/thermald/thermal-conf.xml that allows fine tuning of thermald. Essentially one declares the thermal sensors on the machine and a set of thermal zone controls that read these thermal sensors and inform thermald the policy to control cooling when specific temperature thresholds are crossed. A while ago I was extolling the virtues of static analysis tools such as cppcheck, smatch and CoverityScan for C and C++ projects. I've recently added to this armoury the clang analyser scan-build, which has been most helpful in finding even more obscure bugs that the previous three did not catch. scan-build: The analyzer encountered problems on some source files. ..and running scan-view will show the issues found. For an example of the kind of results scan-build can find, I ran it against a systemd build (head commit 4df0514d299e349ce1d0649209155b9e83a23539). As one can see, scan-build is a powerful and easy to use open-source static analyser. I heartily recommend using it on every C and C++ project. While doing some thermal debugging this weekend I stumbled upon the rather useful temperature monitoring utility "Psensor". I configured it to update stats every second and according to perf it was only using 0.02 CPU's worth of compute, so it seems relatively lightweight and shouldn't contribute to warming the machine up! I like the min/max values being clearly shown and also the ability to change graph colours and toggle data on or off. Quick, easy and effective. Not sure why I haven't found this tool earlier, but I wish I had!